$1,240 from 18 donors $1,000 goal met! I am compelled to support Soulumination in celebration of the 60th birthday of its founder Lynette Johnson, who last year faced her own battle with Lymphoma. My participation with Soul started in 2007 when I became a volunteer photographer. This last year I have had the privilege to be the Program Director for Soulumination. I hear daily just how meaningful the pictures we take are to our families. The work is heartbreaking but at the same time beyond meaningful. Lynette IS the heart of Soulumination. Her dedication to Soul is hands on. She continues to photograph families and always comes back saying just how special each child/adult is. This is after hundreds of Soul shoots. Putting our families first is always her first priority. She is an inspiration and leads by doing. Giving and more giving. 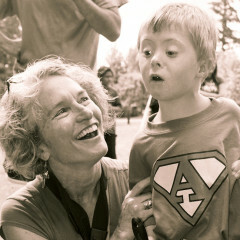 I believe with all my heart just how important this work is and how important it is to continue to provide these very special individuals and families with life-affirming photographs. Tell Susan why you this cause!